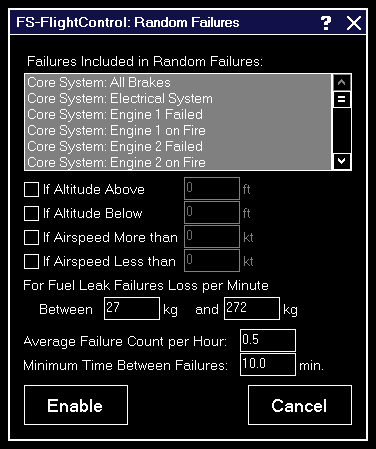 Fail any aircraft component with just one click manually or define detailed failure conditions like fail if aircraft is above a specific altitude or airspeed. 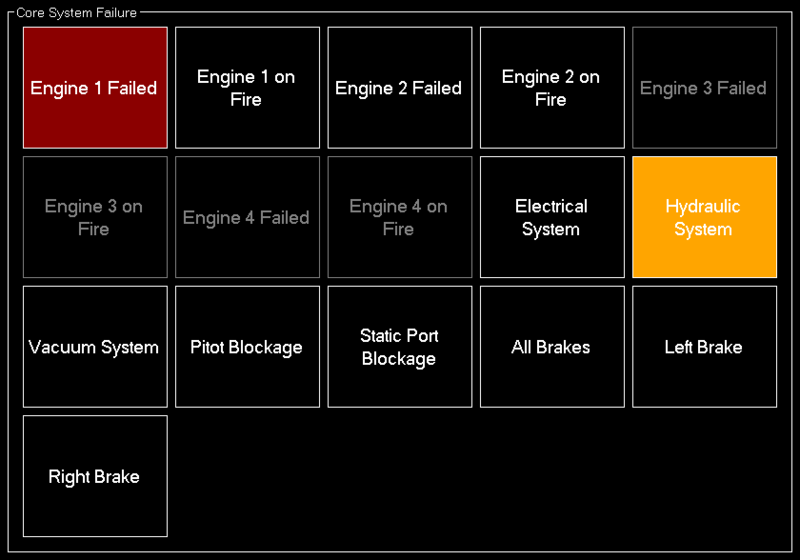 Note: By default the flight simulator standard failures are shown here, but FS-FlightControl does have support for extended aircraft failures of several third party products. You can choose the failure source in the Settings module. In this area you can fail all core aircraft systems like engines, electrical system or brakes. Produce fuel leaks in all or individual tanks with this section. Here you can stuck the aircraft gear and flaps in a certain position. Fail one or more panels here to force the pilot to get along with the situation also without that specific panel systems. 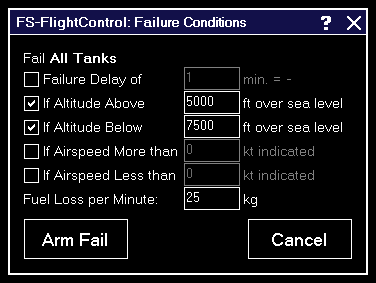 After clicking on a failure button in one of the sections above, these failure condition options will be displayed. Enable the check box before a condition to enable it. First you can define if the failure should be in effect immediately or delayed for a certain amount of minutes. 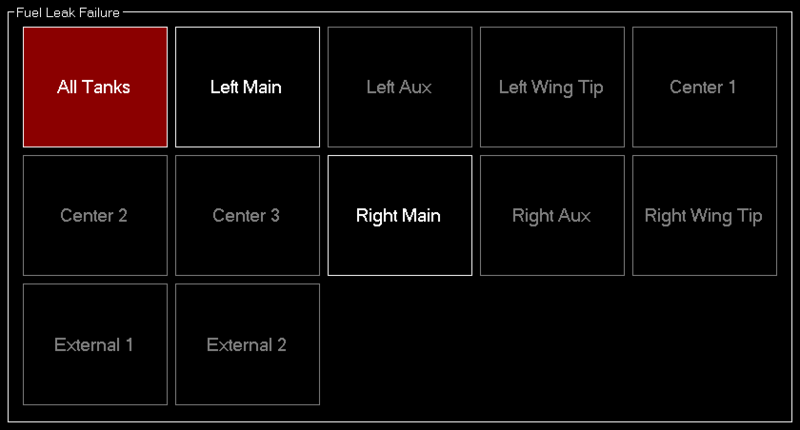 Then you can choose a minimum and maximum altitude (MSL). If you enable one or both of these conditions the failure will be only in effect within this altitude range. 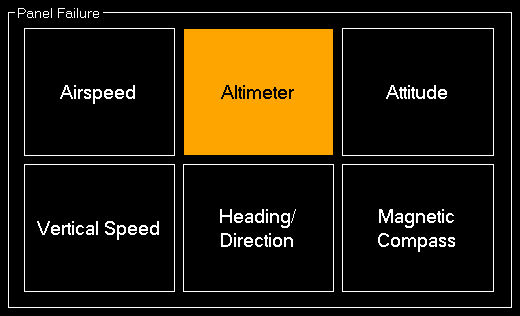 Additionally you can make sure that the failure will only occur within a certain (indicated) airspeed range. In case the failure is a fuel leak you will see another option where you need to enter the amount of fuel that is lost per minute. To enable a failure click on the Enable button. If you click on an already active failure you can disable it here again with the Disable button, too. Beside triggering specific failures directly there is also an option to let FS-FlightControl generate random failures. Therefore click on the button Random Failures first. 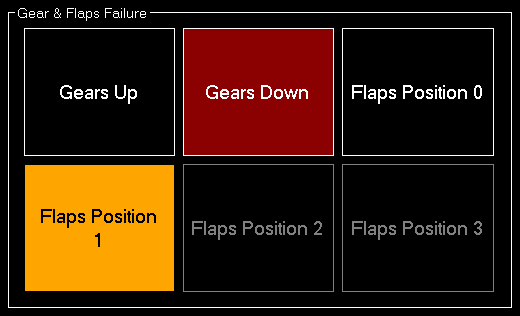 Then first select all failures that should be included in the random failures. After that you can define the conditions when random failures may occur. The condition settings are the same as for the normal failure conditions above. For fuel leaks you can additionally define a range of fuel loss per minute. The exact value then will again be chosen randomly within the defined range. Finally you have to define the average number of failures that should occur per hour and the minimum time between two occurred random failure. Note: Keep in mind that failures number per hour is just an average value - everything is still random. You can also use decimal number (smaller than one) to get even less failures. Use the button Clear All to reset all failures again.